A couple weeks ago I joined an evening painting group in Newburgh, New York. 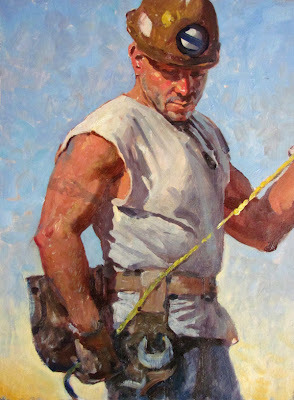 For the three-hour session, we had a model named Larry who works a day job in Manhattan as a "skywalker," a structural iron worker in high rise construction. I painted him in oil against a simple sky-tone background and cropped him tight to make him look even more imposing. 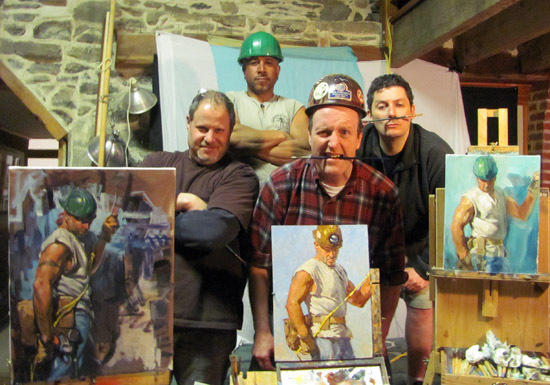 Garin Baker (left) was the host for the session at his studio, called the Carriage House Atelier. That's Kevin Ferrara with the "brushstache" on the right. Contact Garin if you're interested in his instructed or open sessions. Larry will be there this Thursday in a flyfishing outfit. Thanks. I wanted to paint all the decals on the helmet (the one I'm wearing in the photo), but I ran out of time. Three hours goes by so quickly! Thanks Jim for the post. Always great when you join us, raising the bar, even though I had a bit of a head start on the iron worker pose. Looking forward to next time. All three are very impressive paintings. Any chance of getting close up shots of the other two? I especially like the "blocky" brushwork on yours, James. It reminds me of the work of some mid-20th century illustrators - though names are escaping me. Just 3 hours?... beautiful painting! I like the brush stroke, goes very well with the subject. I draw in pencil and like details, I like taking my time. How would u think a delicate approach would change the image of the stocky worker? Thanks, everybody. This might go to my head, but keep it coming! I learned a lot from being around my brother brushes. Half the fun is seeing how other people approach their paintings. And it really helps having a model who is the Real Thing. I wish I could paint so loosely (hell, I wish I could paint). I am a medical illustrator by trade and a fiber artist for fun, all my work is so structured and tight. Beautiful job, keep sharing the good work. Like J. Anthony, I'm more of a tecnical artist. I wish I could loosen up. I'm loving the textural brushwork. I'm intersted in giving myself a birthday Artist Retreat present next sumer. Does Gavin provide Art workshops. I hope to attend something in the New England area in 2013 for a week or even a weekend. i run a workshop in Chicago that is similar. If a trip to the midwest ever comes up I'd be happy to have you drop in. Wowzers! Finished painting in 3 hours. I am so damn jealous of your skill....but it's that 10,000 hour rule of Malcolm McDowell paying off. Fabulous painting. Thank you for sharing. Well I truly liked it.